(Newser) – Who doesn't like a farmers market? 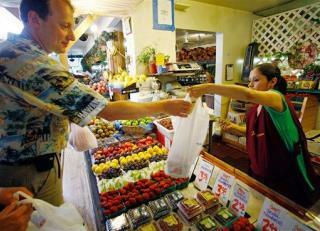 Organic food, weird jams, and a sense of community have drawn shoppers nationwide for years. But a new study says the markets don't really fulfill their reputation of promoting a healthy diet—and definitely don't save people money, Pacific Standard reports. "There seems to be much enthusiasm for using farmers markets" to improve food quality in areas where healthy food is lacking, a team of researchers writes in the journal Appetite. "It is hard for us to share this enthusiasm." Their study of 26 farmers markets and 44 stores in Bronx County, NY, found that the markets offered 26.4 fewer items of fresh produce on average, fewer commonly-purchased foods, and more expensive items overall, even among regular produce. Pretty much a crappy article... and here's why... 1) Nowhere does it mention that one of the main differences between organic and conventional food is pesticides, gmo's, antibiotics, growth hormones and dyes. 2) Yes... the food may cost more...You are supporting your local economy and local farmer. You know who is growing your food and can talk to your farmer about their cultivation practices. 3) There's crap where ever you go. Some farmer's Markets are better than others. You can always find "organic" junk/processed food anywhere. 3) By supporting your local farmer you are a FOOD ACTIVIST. You are directly taking yourself out of the gmo/big agra loop if you choose. 4) You have reduced your carbon foot print. Most farmers markets don't allow resellers and generally the produce/meat/dairy/baked goods/body goods has to be produced within a 100 miles. 5) Tennessee has the largest proliferation of farmers markets in the country. 6) Freshness and quality. We have several markets where the artisans are stellar. No comarision to conventional crap in the store. Where's the study? Let's see where the info is coming from. I would say that it really depends on where you live. In the greater Seattle area, there are MANY Farmer's Markets...usually each neighborhood has one...and the produce you get from them is FAR superior to the imported junk the supermarkets carry! I don't shop at them nearly enough...but when I do, I am always rewarded by FRESH produce that tastes FAR better than the container ship delivered crud you find at Safeway! Honestly, this is anecdotal at best. I do most of my shopping at our local Farmers market and the prices are lower. I pay 2.99 for a head of Romaine lettuce at Publix or get a bigger, fresher one at the Market for 1.49. There is a bigger variety of produce (especially fruits) than the big chain grocers. It really depends on where you live. To be more accurate the study should have a broader scope of areas.